The other night I was making dinner Rylan came up to me and said “uhhh why is there cottage cheese mom”v, we neve The other night I was making dinner Rylan came up to me and said “uhhh why is there cottage cheese mom”, we never have cottage cheese in our house, like ever. It’s not the first choice for any of us as a snack idea because quite frankly I forget that cottage cheese even exists. My mom told me about this recipe she had made a while back that she used cottage cheese to make fettuccine sauce. 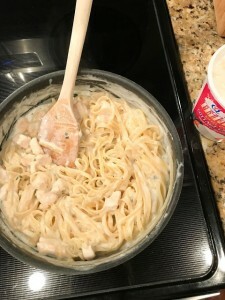 I was actually excited to try this recipe because fettuccine alfredo is one of my FAVORITE recipes. So I wanted to share our new recipe my mom introduced us to. I know a lot of you are probably thinking this screams nothing but carbs because its noodles, but I have to tell you thanks to Hiland Dairy Cottage Cheese this is actually a somewhat decent recipe. 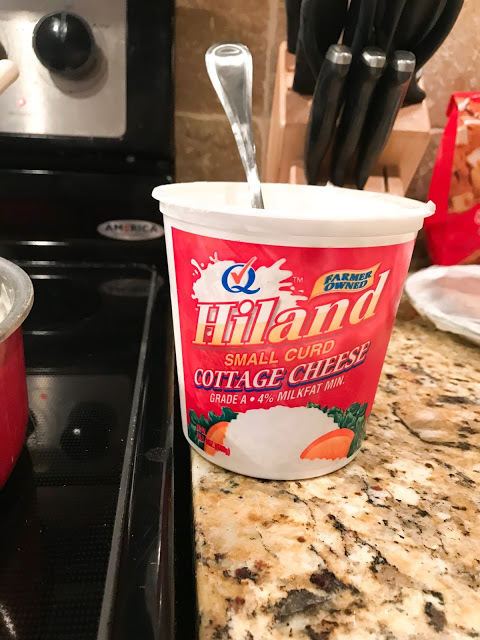 Before I jump into this recipe lets first talk about Hiland Dairy, my mom has been using their products for years, for as long as I can remember she has used everything from milk to cottage cheese to heavy whipping cream. For our fettuccine recipe, we decided to use the small curd Hiland dairy Cottage Cheese because we felt that it had a lot of extra protein in it. Cottage cheese is so versatile you can put cottage cheese in so many things, over fresh fruit to make a yummy fruit salad, a quick and easy on the go healthy snack and etc. Who would have thought about adding cottage cheese, milk, parmesan cheese and some salt and pepper together to make a yummy recipe, because personally, I thought my mom was crazy!!! I hope that you found this post to be helpful, I encourage everything to check out Hiland Dairy website to learn more about their products and to check out their recipes too. See how you can be entered for a chance to win prizes worth $200. Put all ingredients, except basil, into blender and blend until smooth. Pour mixture in small saucepan and add basil until heated through and smooth. Add more basil, oregano, salt or pepper for taste. Let cook on low heat for about 5 minutes, stirring occasionally. Add cooked pasta right before serving and let soak in for a couple of minutes. Add meat optional. It’s as simple as that. Now, enjoy!